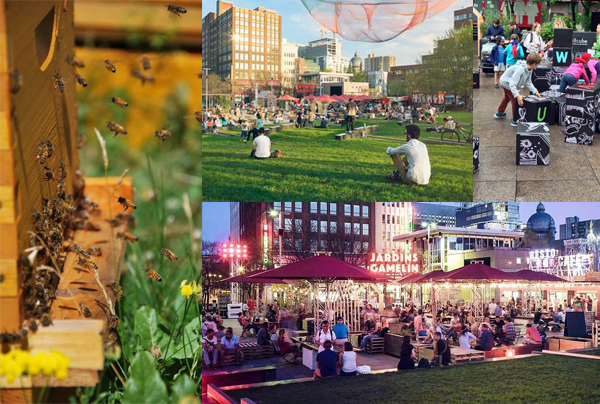 It’s the summer of 2016 and Montréalers have fallen in love with Jardins Gamelin, in only its second year of existence. If you haven’t been, think green space, entertainment (live music, DJs, circus), beer garden, cultural & family activities and everything in between. You can go simply to hang out, listen to music, talk, read and play games… OR! You can take part in the Atelier Familial on Sunday and learn how to keep bees… OR! You can catch amazing free circus performances – MONTRÉAL COMPLETEMENT CiRQUE will be in the heart of Jardins Gamelin all weekend performing the final round of their Fracas show twice nightly (7pm+10pm). And if the whole circus thing is a family affair, good news, because there’s an Atelier de cirque on Sunday for families! Now, I should note that, in case of rain (there maybe rain Friday night and/or Saturday) the patio umbrellas they have there are immense and you can find pretty good shelter even if it is raining. Yer good to go pretty much any time of the day – morning for casse-croûte breakfast, lunch time picnic, 5 à 7 or late evening DJ dance party! The casse-croûte is open until 11:00pm, thank you very much. By supporting the QdS, you’re supporting local cultural innovation and helping propagate a great vision. Over the years, the Jardins Gamelin has transformed from seedy drug dealing headquarters to a beautiful central downtown oasis… however the north end of the Jardins still has some rougher edges, so to say. I’m being a beer nerd here but I’d love to see Jardins Gamelin support a local microbrewery or two and serve up some good beer (they’ve got Sleeman products on tap and the Railside Session Ale was the best of the lot I’d say). Can the rain please just stop harassing us on weekends? Thank you. Les Jardins Gamelin, Place Émilie-Gamelin in the Quartier des Spectacles, 514-879-0009. Either before or after your Gamelin experience, hit Ste-Catherine street and head east along the pedestrian portion of the famous boulevard. Every summer, this portion of Ste-Catherine street running through The Village is adorned with a one-of-a-kind canopy of suspended pink balls, is awash in terraces for libationary fun, and is humming with energy all around you. Get up close and personal with the Diable river this weekend, then go ahead and climb high above it into, and onto, the Laurentian mountains in the most beautiful of places – Parc national du Mont-Tremblant. Since future I&A issues will dive into various other elements of the Parc, and assuming you’ve been to somewhere in or around the Parc, I’ll jump right into the Via Ferrata courses they have set up. We did the Itinéraire Intermédiaire course and it was glorious for all levels (we were a mixed bag of about 20ppl) and just the right amount of time I’d say (~ 4hrs). The instructors were great, the installations were well maintained, and the course was challenging, scary & awesome all at the same time. If you’re scared of heights, depending on the level of said fright, you may be alright (we had one lad who is quite terrified of heights and he made it through… albeit with a constant look of unease on his face). 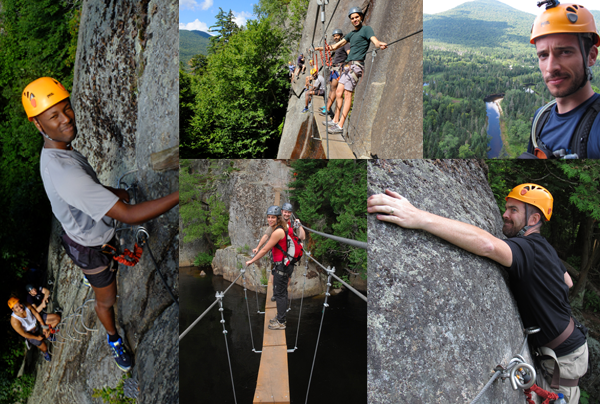 You’ll cross bridges à la Indiana Jones, scale rock faces you thought only mountain goats could, and (optionally) leap from fingertip to fingertip as you scale a Laurentian wall. I did see some young’uns there (age 8+) so be sure to check the details on the Sépaq site for family outings too – pretty cool I bet! You’ll see Parc national du Mont-Tremblant in a whole new light from a whole new vantage point! You’ll try something you probably have never tried before (and may very well get addicted to) and you will challenge yourself. In terms of getting down & dirty with the outdoors, and breathing in the fresh, the wondrous and the momentous, well… this is it, my friends. It’s not necessarily an activity suited well for everyone. I suggest checking a video or two to make the call for you & your crew. Mosquitoes. Oh man. Once yer up on the rock faces, yer all good, but walking through the forest en route to the course will leave you a pint or two short (of blood). If you freeze up and get stuck, it’s not a simple task to extract yourself from the course without simply backtracking said course that made you freeze up in the first place. On your way home, do yourself a favour and stop at Boulangerie la paysanne d’antan for a fresh, hot chocolate croissant. You earned it (probably… but if not, who cares, have one or two anyway, it’s the weekend!). Have feedback or suggestions for places in & around Montréal that we should explore together? Please email me.